Mashery clients tells us they get tremendous value from the reporting and analytics data surfaced through the Mashery Dashboard. 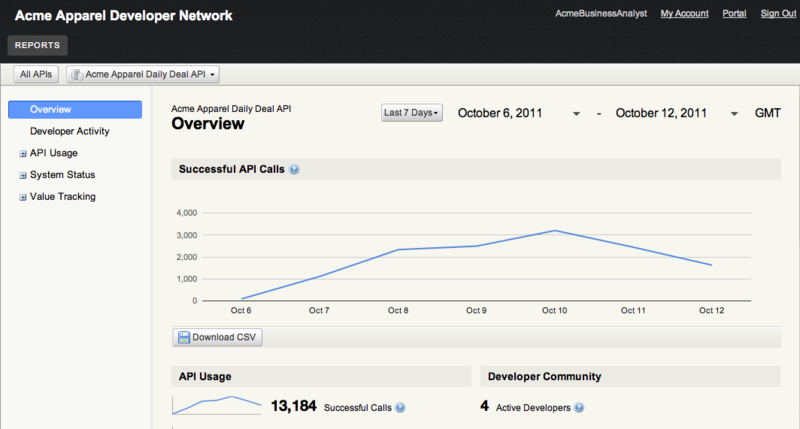 From detecting trend changes in API traffic to evaluating the value of developer apps, clients can leverage the metrics and underlying data to optimize their API programs. However, as their APIs become more successful and visible, API managers also find that colleagues from around their organizations are clamoring for this data. Demand is coming from marketing folks tweaking messaging, business analysts evaluating API investments, and executives trying to understand how the API powers the business. To satisfy this appetite for API-related reporting without sacrificing security, Mashery has released a new user role: Reports User. People with the Reports User role can access reporting data, and only the reporting data, from within the Mashery Dashboard. When they log into the Mashery Dashboard, their view will be similar to the one below, with access only to the Reports tab. Unless they have other roles, Reports Users cannot make changes to API settings, developer accounts, or portal content.